Asta and Andrew take on the world! My name is Andrew Murgatroyd. I am a teacher, marine biologist, sailor and musician. My teaching philosophy is that the most meaningful connections are made experientially- that is, when learners are immersed in an environment they learn by doing. A sailboat is the ideal classroom for marine biology and oceanography and since I was a high school student it has been my goal to teach aboard a sailing vessel. I studied marine biology at the University of Victoria and became fascinated by ecology and, frankly, terrified about the state of the oceans and our impact as human beings. I studied biological oceanography, plant and marine ecology and organic chemistry at UVic, and took a summer semester at the Bamfield Marine Sciences Centre. In Bamfield we studied marine-terrestrial interactions and nutrient flow with the use of radioisotopes. I came to realize that I was more naturally a teacher than I was a research biologist and I knew that I could have a greater positive impact on the planet by sharing what I had learned with others. I made it my mission to teach my students about biology and conservation through experiential learning. After I earned my BSc. Biology from the University of Victoria with a focus in marine ecology I continued my education with a BC teaching certificate in 2008. I started my teaching career with yearlong internship teaching Biology, Science and Drama and now I have over 10 years of teaching experience, both inside and outside the traditional classroom. I have since returned to Bamfield with my own students and showed them the interactions of the tides, the bears, the forest and the salmon first hand. I’ve seen that “aha!” moment in their faces and remembered when it all clicked for me, far from the classroom on a desolate beach, in the pouring rain, watching a bear roll over beach rocks to hunt for crabs. I have taught Math and Geography for the St. Michael’s University School (SMUS) experiential program for 2 years. In this role I was able to take my classroom outside and guide my students sailing and winter camping. I have also guided kayaking, sailing, and hiking trips for the SMUS outdoor education program for several years. In 2012 I held the position of Educational Coordinator aboard the scientific research vessel Sea Dragon, the flagship of the non-profit organization Pangaea Explorations. For the summer expedition, dubbed the “One Water Story”, I created a course for middle school and high school teachers which explored ways to incorporate ocean literacy, Great Lakes ecology and conservation into the classroom. Once my obsession with sailing took ahold, I continued with sailing experiential education with Broadreach global summer adventures for youth as a catamaran skipper in the Caribbean where we sailed to 10 different ports and certified our students in PADI advanced open water SCUBA. ​I've just returned from 2 years at sea as the Shipboard director for Class Afloat and sailed over 45,000nm on 7 Atlantic crossings, 4 equator crossings, and more than 20 countries! I am currently working on my Canadian 60Ton Master's Captain's license and Asta and I hope to start our own sailing expedition company! My name is Asta Mail Murgatroyd, and I am a marine scientist, educator, blogger and environmentalist. ​My goal in life is to share my passion and hopes for our planet's waters with as many people as possible. Always an adventurer at heart, I have spent the last several years discovering my passions in life, and working hard to convert those passions into purpose. My love for marine science, music, art, and writing inspire me daily. I have a BSc. in General Sciences from the University of British Columbia, with a focus on marine biology and ecology. I also studied at Bamfield Marine Sciences Centre and the University of Stockholm in Sweden. I have worked as a science facilitator, on board naturalist, dive guide, teacher and program coordinator for marine science organizations and schools all over the world. I have lived and worked in 9 different countries, and have enjoyed every minute of it! I completed a Master's of Professional Science degree from the Rosenstiel School of Marine and Atmospheric Science, a division of the University of Miami, in December 2013. For my MPS degree thesis requirements, I took on the role of Great Lakes Expedition Coordinator for a sail research organization known as Pangaea Explorations, LLC. I was responsible for developing marketing and implementing a four month round trip 'citizen science' expedition from the Atlantic coast to the Great Lakes of North America. 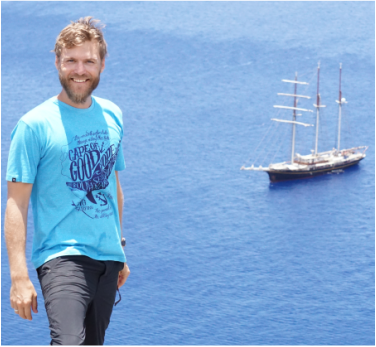 The expedition, known as the 'One Water Story' was a sail training research program designed to allow guest crew members to take part in the collection of scientific data, while learning more about the issues facing their local environments. The project was very successful, capturing the interest of both national and international news media, and has even led to some very interesting local changes to environmental policy in the Great Lakes region! My new professional aim is to combine my passions with those of my partner Andrew to find new and innovative ways to approach the environmental issues we currently face. I am passionate about experiential education, community initiatives, and finding ways to create real and lasting positive change to our marine world. I truly believe that a beautiful future is possible not only for our planet, but for mankind as a whole. However, many changes in our personal and cultural behaviors need to be made in order to shape the future we desire.